Rewa normally refers primarily to the flower, and Rewarewa to the tree itself. Proto Polynesian: *Lewa	Cerbera odollam. [Above] Rewa, flower of Knightia excelsa, Rewarewa. [Left] Milled timber of Rewarewa. The tropical and Aotearoa "rewa" have in common their long leaves -- this similarity is quite apparent when you encounter the trees in person, although in many other respects they are quite different. 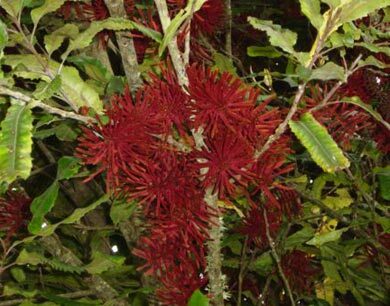 For a start, the flowers of the New Zealand tree produce a beautifully flavoured nectar eminently suitable for human consumption -- it was stored in hue (gourds) and sipped through a reed straw as a remedy for sore throats. The seeds and stems of its tropical namesake contain a deadly poison much utilized for murder and suicide! The shapes of the trees are also very different, with the Knightia having a slim, tapering conical shape retained into maturity, while the Cerbera is a much more spreading tree. Similarly the Knightia fruit is a slim pod, whereas the Cerbera is roundish or oval and considerably larger. Both however are bouyant when dry, the Knightia pods opening into a facsimile of a Māori voyaging canoe, complete with prow, whereas a split Cerbera fruit would be more like a coracle. The leaves of the rewarewa are deep green, leathery and tapering, narrow along most of the length in young trees but becoming shorter and a little wider towards the middle in more mature trees. The New Zealand species is endemic, with two related species of the same genus in New Caledonia. The rewarewa and one other tree (the toru, Toronia toru) are sole representatives of the Protea family in New Zealand, remnants of the Gondwanaland flora shared with New Caledonia while there was still a land bridge between the islands up to about 40 million years ago, and with Australia before that (George Gibbs, Ghosts of Gondwana, p.80). The rewa is also one of the relatively few richly coloured flowers in the New Zealand landscape -- the flowers of most species have evolved as while or green over the millennia. Manuka (Leptospermum) was used as fuel to heat the oven. The wood of therewarewa (honeysuckle) was not allowed to be used for this purpose because its wood, when decayed, is phosphorescent, like a glow worm, which latter is the offspring of Tangaroa-piri-whare, the mischief maker, and if the wood was used for such a purpose some mishap would occur to future crops. Rewarewa is a tall, slender conical-spaped tree which reaches about 30 metres in the forest. In mature trees the entire lower-half of the trunk may be bare of branches. The young trees though are slender cones tightly wrapped in leaves and branches, very conspicuous in regenerating forest -- there is a very nice photograph of a grove of rewarewa in that environment in Dawason and Lucas's New Zealand's Native Trees (p. 295). 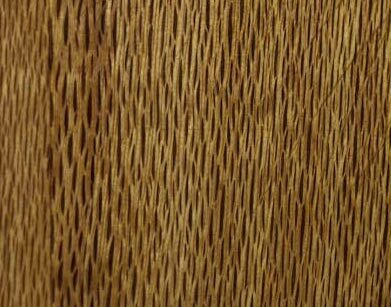 The wood is beautifully flecked and greatly esteemed for parquet flooring, panneling and decorative purposes. As noted above, it does not make good firewood! References and further reading: There is a well-illustrated section on Knightia excelsa in NZ Native Trees - details in the bibliography. The tree is also featured on the NZ Plant Conservation network's web site. Photographs: Rewarewa wood: Te Māra Reo; rewa (flower) from Forest Flora Plant Nursery.